cateyegirls, n. plucky repurposers of antique, vintage and primitive elements. Mouseover thumbnail to enlarge. Double click thumbnail to "hold" enlarged image. We snapped this shot in Agent 99's backyard before the Kitchen Queen drove away with a car full of pristine Pyrex -- all headed for her mall space in Snohomish. If you love Pyrex, this was a sight to behold! 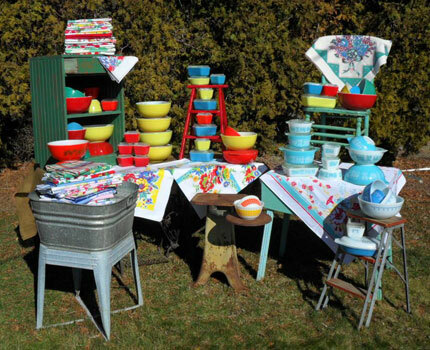 Visit the Kitchen Queen in Snohomish and you will find the mother lode of Pyrex! 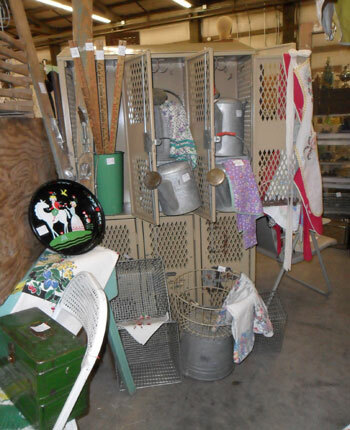 Yes, those linens in the galvanized wash tub and on top of the little green primitive cabinet are stacks of pristine 1950s tablecloths -- California Handprints mostly. What is it about Pyrex? Yes, they are bright and happy! Yes, they are structurally functional! 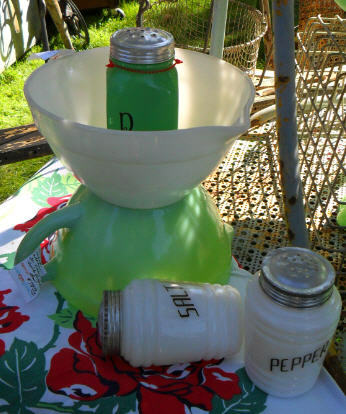 But there seems to be something more that draws us to these rather common pieces of kitchenware -- nostalgia. Memories of our mothers and grandmother's kitchens and baking Christmas cookies and bread . . . perhaps, they are just a reminder of a simpler time in our lives? Regardless, we all love vintage Pyrex nesting bowls and baking dishes . 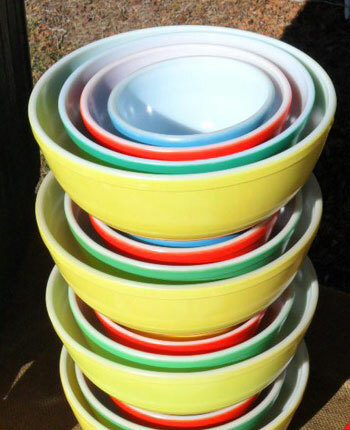 . . as evidenced by this tower of pristine bowl sets! 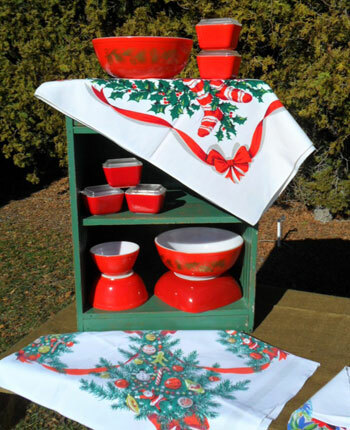 Auh, a collection of Christmas Pyrex! 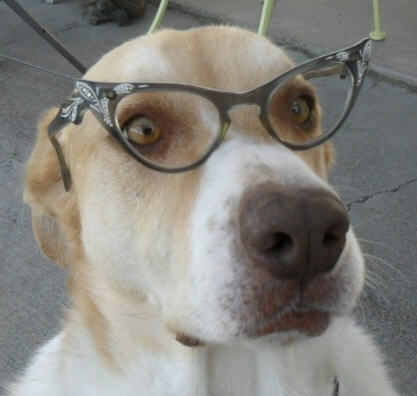 Edward Beagle in cateye glasses! Vintage Coca Cola signs . . . and old gumball machines and rusty junk Oh my! We, cateyegirls and the Vintage Coupe, took Center Stage at the Roxy with a garden display that in places went all the way to the ceiling! 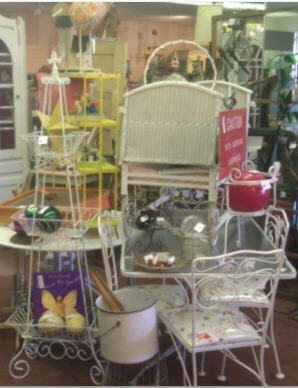 Stuffed full of vintage garden! The little wicker thing, on top of the table with the wheels . . . it's the single most charming baby bed you ever did see and also look smashing on your front porch filled with flowers! 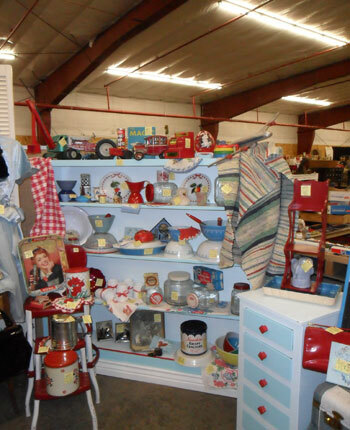 This was one of our displays at the Fall Country Nester's Antique Show in Kennewick (September, 2010). The paint for the display cabinet, as with the color palette of our website, was inspired by a pair of 1953 Kimball Dihedral "outboard water skis" that Agent 99 stumbled on to. They were so inspiring, reminding us all of the beach and summer, that she is having a hard time letting them go! 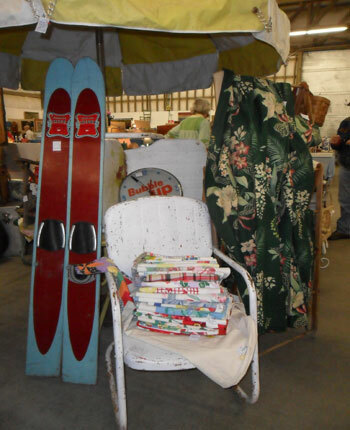 Skis are fun things to repurpose into shelves for your retro kitchen, into a chair or whimsical wall art for your beach themed living room. Not much of a headstall being held together with a wonderful pair of US Cavalry conchos. 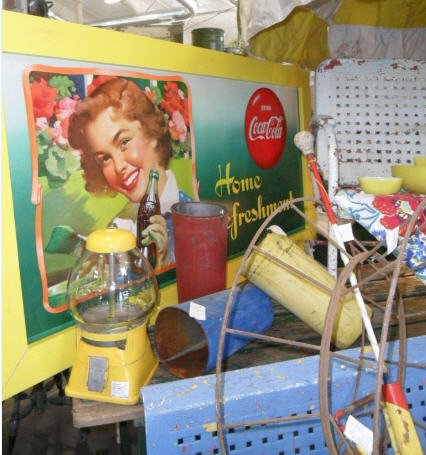 This image was snapped at the Spring Tri-Cities Antique Show in Pasco, Washington. Agent 99 is always looking for old horse tack, bits and spurs. Cowboy collectables! Agent 99 brought a few unusual "cowboy" things, like a pair of bat wing chaps, several prison-made bits, an old Hamley stamped split-ear headstall with three-piece sterling buckles and engraved and signed grazing bits. Together the collection made a bold statement in her space's "tack room." While many customers were thrilled to find reasonably priced cowboy collectables, her cowboy collectable display was picked over pretty good by Sunday morning. Good thing there are some cowboy treasures waiting in reserve for the next cowboy collectable antique show vignette! Like cowboy collectables, like bits and spurs and chaps? Email Agent 99, tell her what you are looking for! Here is our reluctant model, he just finished his daily calisthetics . . . hence, the sweaty chest, Socks Mitchell in a vintage, studded breast collar. 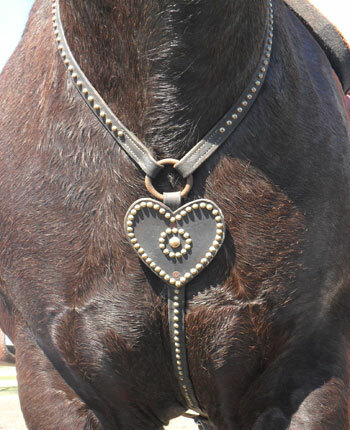 Hearts were particularly popular shapes used in vintage horse tack and cowboy collectibles. This particular vintage breast collar found its way to Agent 99 out of a long time cowboy gear collector. 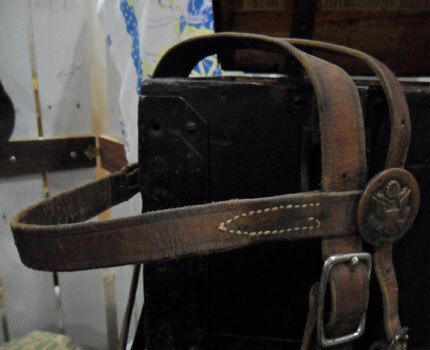 And, while not in perfect condition, it is a wonderful example of how horse tack was embellished with studs and shapes. Bling of yesteryear . . . for horses and cowboys! What is it about the greens from the 1930s and 40s . . . they are so cheerful. We love Jadite and think it is one of those kitchen collectibles that is always in vogue not ony because of the color. Most Jadite was structurally functional, as useful today as it was when it was new. We hunted high and low for these three blocks, tools for branding our business . . . and then, since we price everything in our mall and funky junk show spaces, they sold. So we're inspired to find more, maybe D O G too! The Cat Eye Girls price everything, there are no fixed displays in our antique mall or antique show spaces. You will never see a price tag with "NFS" (not for sale) where the price should be . . . Everything is for sale! That said, we have to rally and scramble at times to re-create a display when a display piece sells. This was the case at the Spring Monroe Antique Show April 9-10, 2011. Agent 99 sold this wonderful repurposed White sewing machine base and old bead board pantry door that together made a display table for the "garden." Hence, the garden moved to the gym lockers . . . and then she sold them! And, that's how it goes when everything is for sale! It is our express goal to sell all of our wonderful display pieces, disrupt our mall and show spaces and start anew with what we have and what we find. Every horse needs a government issued blanket! We have been unable to definitively date this US Cavalry horse blanket. What we can say is that it was made for a much smaller horse than Socks Mitchell (he weighs in at 1400 plus pounds and stands 16.3 hands). Socks Mitchell is our cowboy collectibles model, for tack and anything marked US Cavalry. 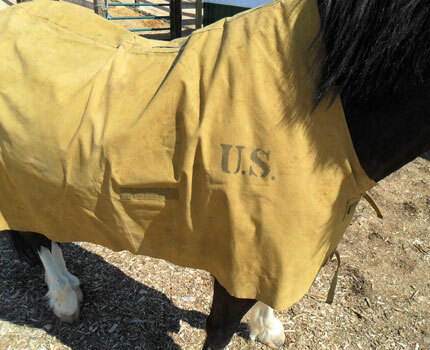 Agent 99 has two US Cavalry horse blankets, the one shown which is simply GI "canvas" and another with the same outer material with a wool liner. Both appear to be sized to fit a much smaller horse than Socks Mitchell . . . Socks wears an 84, so these must fit a horse that weighs about two-thirds of what Socks weighs and be about a size 76. We are always looking for vintage horse tack, including vintage bits, headstalls, breast collars. Holding everything up is a primitive old build-in cabinet that Agent 99 rescued. It's a bit unusual as it is nearly 7 feet tall and it looks like it is about to tip over as it is wider at the base than at the top. Jadite, Bauer, kitchen collectibles brighten up the inside of the cabinet. 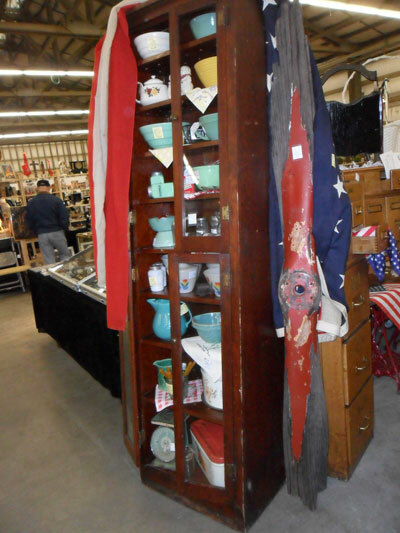 48 star flag is draped across the top of the cabinet as a backdrop to a very well loved old propeller. We love blending elements, pairing unlike things together to draw attention and give reason to pause and study! There is a lot of happiness under that retro umbrella! 1953 Kimball Dihedral Outboard Water Skis. 1960s umbrella in yellow and white. And, "bubbling up" out of all of those unlikely paired elements are many "beginnings" to the perfectly decorated "funky junk" living room or outdoor living space or 1950s kitchen nook . . . All it takes is one perfect element to inspire a room transformation! What do the Cat Eye Girls mean by repurposing and recycling? 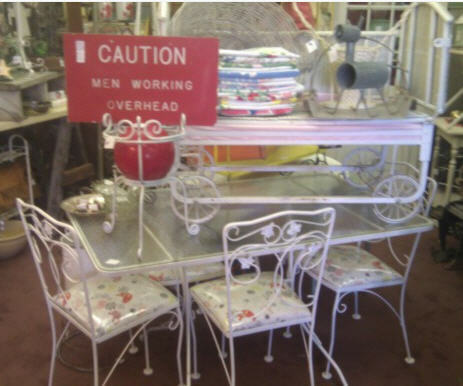 We provide fun, inspiring and practical ways to use old things in new ways. 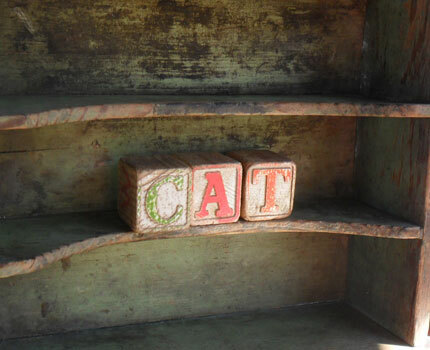 As creative hunters and gatherers of old things we recycle our finds into loving homes. We have been known to change the form of something, like turning a twin bed frame into a bench with storage. Though mostly we concern ourselves with repurposing things without changing the form or original structure. We just think up new ways to use old things.